Southport, CT - Deb Kouzoukian, a long-time Fairfield resident, has been elected President of The Fairfield Women’s Exchange for a two-year term. Deb is well known as one of the busiest people in town and one of the most accommodating. 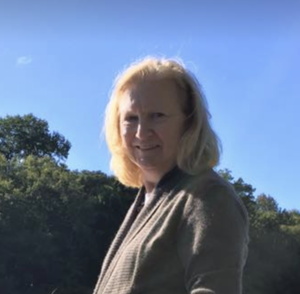 For years she has managed business and personal interests without a hiccup: Office Manager of Southport Design Ltd for 35 years, a member of The Fairfield Garden Club for all of that time and a ceramicist at Silvermine Art School in Norwalk for a decade. Her love of bee-keeping led her to build an apiary, Mulberry Hill, located on the property of the antique home in which Deb and her husband, Zohrab, live, the house where Deb grew up. The apiary has three thriving hives and there are plans for a fourth next year. It produces honey, bees wax for candles and creams which are sold at the Exchange. The Exchange has worked for years to have consumers understand it is not primarily a consignment shop. Rather, it’s a non-profit shop whose proceeds are donated to charities that further the health and well being of women and children. It provides a showcase for talented artists and craftspeople to sell their unique products such as wooden toys hand-knit children’s sweaters that are passed down through families. It also offers a retail children’s section, select specialty foods and antiques and an accessories department that with unique gifts for men, women and the home. Deb is committed to helping consumers to better know the Exchange.